Geochemical Exploration 1976 is a compilation of 30 papers presented at an International Geochemical Exploration Symposium. The first five papers included in this journal are entitled World Mineral Supplies-the Role of Exploration Geochemistry; Application of Gold Compositional Analyses to Mineral Exploration in the United States; Tellurium, a Guide to Mineral Deposits; Geochemical Prospecting for Volcanogenic Sulfide Deposits in the Eastern Black Sea Ore Province, Turkey; Anomalous Trace Elements in Pyrite in the Vicinity of Mineralized Zones a Woodlawn, N.S.W., Australia; and Application of Lead Isotopes and Trace Elements to Mapping Black Shales Around a Base Metal Sulfide Deposit. Other papers included in this volume are about primary dispersion; sulfur isotope and trace metal composition of stratiform; geochemistry of the mammoth copper deposit; geochemical indications of concealed copper mineralization; Zinc-Lead-Silver deposit; and geochemical dispersion patterns. The book also discusses sulfide mineralization, serpentinites containing nickel iron sulfides, geochemical analytical techniques in determining ""total"" compositions of some lateritized rocks, natural gamma radiation, Uranium, Uranium isotopes, and soil hydrocarbon geochemistry. 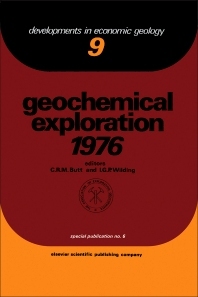 The last three papers presented in this volume are entitled Detection of Naturally Heavy-Metal-Poisoned Areas by LANDSAT-1 Digital Data; Recognition of Mineralized Areas by a Regional Geochemical Survey of the Till Blanket in Northern Finland; and Sequential Soil Analysis in Exploration Geochemistry.